How can I add my own CSS? Consider using a Child Theme. Use child theme available with theme. Edit the /assets/css/child-style.css file to implement your own changes. Build your own child theme (http://codex.wordpress.org/Child_Themes). And add your custom styles. 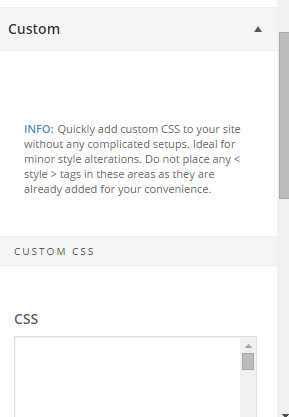 Use theme custom CSS box, available in theme customizer, which allows you to quickly add custom CSS.